Move over C. L.R. 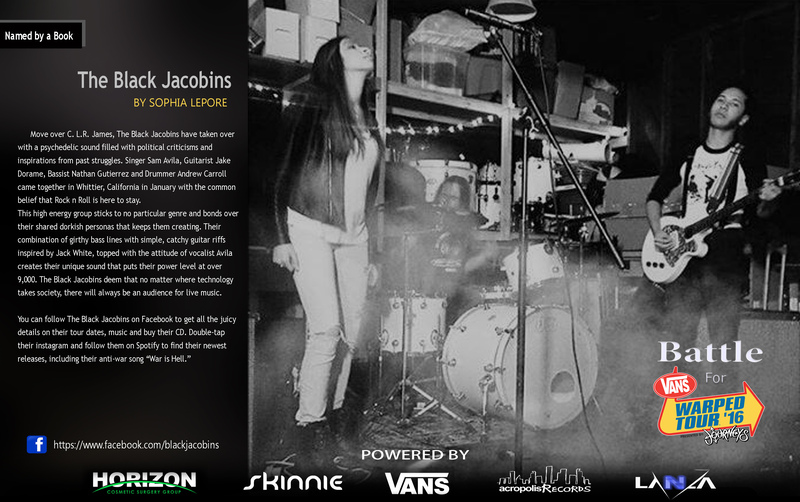 James, The Black Jacobins have taken over with a psychedelic sound filled with political criticisms and inspirations from past struggles. Singer Sam Avila, Guitarist Jake Dorame, Bassist Nathan Gutierrez and Drummer Andrew Carroll came together in Whittier, California in January with the common belief that Rock n Roll is here to stay. This high energy group sticks to no particular genre and bonds over their shared dorkish personas that keeps them creating. Their combination of girthy bass lines with simple, catchy guitar riffs inspired by Jack White, topped with the attitude of vocalist Avila creates their unique sound that puts their power level at over 9,000. The Black Jacobins deem that no matter where technology takes society, there will always be an audience for live music.